You have middle school or high school-aged children. Perhaps you are just starting to ask, “What is the best way to pay for college?” or maybe you have been diligently saving in a 529 plan for many years. You start talking to friends and go into “sticker shock” when you hear people throwing numbers around like $50,000, $60,000 or more for a single year of tuition, room and board at many schools. And while it’s unlikely you’ll actually pay full price given the many types of merit scholarships and need based aid that are available, you will be paying far more than your parents paid to send you to school. Prior to the 1970’s, college costs increased roughly at the rate of inflation. Then as public perceptions of the importance of college changed as well as student and parental expectations of the experience increased, costs have skyrocketed. For example, in 1973 a typical male worker made $8,056 a year. The average cost to send a child to a 4 year private school was $2,045 and public colleges were a steal at $514 a year. This translates to 25% of a typical worker’s annual salary for private schools and a mere 6% of income to send your kids off to a state school. Fast forward to 2012. During that year, a typical male worker made $33,904 per year. However, private school tuition increased to an average of $28,989 per year and public school tuition ballooned to $8,646. If you had to pay full price, workers would have needed to shell out 86% of their income for those private schools and 26% of income on average for state schools. And this does not include the cost of room and board! Another way to look at things is in terms of inflation-adjusted dollars. Going back once again to 1973, if we inflate those costs up to today’s dollars, it would be the same as paying $9,876 for a year of private tuition and $2,175 for a year of public school. Compare this to 2015 where the average for a year of private college is $32,405 and public schools come in at $9,410. In the period from 1973-2015, costs have risen by 3.28 times the rate of inflation for private schools and 4.33 times the rate of inflation for public schools. My Kids’ College Ate My Retirement! Given the sobering statistics listed above, it’s my belief that many people need to change the rules when it comes to paying for their kids’ higher education. In my mind, given these soaring costs, it is no longer a parental responsibility to fully fund a child’s higher education. In fact, when it comes to savings, many people think chronologically rather than in terms of what’s most important. Many parents believe that they need to save for college first and worry about funding their own retirement later. Go to a less expensive school. Take out more loans if a particular school is important to them and have far more years to pay those loans back than you do. Delay going to school for a few years, go make some money and then decide if college is the right choice for them. You on the other hand as a 40-something or 50-something have less time and fewer options. Before you know it, your working years will be over and you’ll need a healthy nest egg to cover your living expenses for what will likely be a 30+ year period of semi- or full-retirement. I’ve done the math – you really need to be saving between 10% and 20% of your income every year to adequately fund your retirement. If you’re doing that – great! Go ahead and plan on funding 80, 90 or even 100% of the cost of your kids’ college costs no matter where they go to school. However, if you are behind on your retirement savings, focus on catching up there and consider one of the following options to share expenses with your child. I have a client that uses this option. This strategy requires your child to take out a Federal Perkins Loan for as much as $5,500 per year. They end up with about $22,000 in total debt and mom and dad cover the rest. This is very generous given the total out of pocket expenses (tuition, room and board) at many state schools comes in at over $120,000 for all 4 years. However, it provides no incentive to the child to consider costs when selecting a school. I have a friend who utilizes this strategy. If learning the value of work is important to instill in your child, then this is a great option for you. It is not unreasonable to expect a college student to make $10,000 or more per year. Consider requiring a contribution of at least half this amount from your child to go toward college. Let’s say you use this strategy and require a $5,000 per year minimum contribution from them. What I love about this option is it gives the student a choice. I can make enough money over the 4 years to cover my responsibility and exit school with no debt; or, I need to take out loans and pay them off after graduating. Getting your kids to start making financial choices is the key here. Friends of ours use this strategy and Stacy and I have adopted it as well. For this option, you specify a maximum you’ll contribute each year and leave it up to your child as to how they’ll cover the rest. A great benchmark is the total cost of in-state tuition, room and board for wherever you happen to live. Choose to go to a school that costs near or less than what we’ll cover to ease their financial responsibility. Go to a much more expensive school, but realize their contribution will be higher. Then choose to work and/or take out loans to cover the difference. We have neighbors who take this approach. For each of their children, they have offered to pay 2 full years for wherever they end up going. The other 2 years need to be covered by the child. As usual, when faced with difficult financial choices, people get creative. One of their daughters is attending a local community college for 2 years out of her own pocket, then plans to transfer to her dream school for the final 2 years when mom and dad are footing the bill. This is the only one of the bunch that I don’t personally know anyone who is using, but variants are discussed on many sites that talk about college savings. Within this strategy, consider saving 1/3rd of the projected cost of school in advance, borrowing 1/3rd of the money to pay in the future and having your kids cover the remaining 1/3rd. Have $40,000 parked in the bank in savings. Borrow $40,000 to cover the middle third. This definitely sends a message of “we’re in this together” by being willing to borrow an amount equal to the amount your kids need to cover. All of these strategies are options being used by millions of parents and students across the country to figure out the best way to pay for college as a family. Whatever you decide, be sure to put limits on the amount of debt you’ll incur. A good starting point for students is to limit debt to no more than 100% of your projected starting salary. And for parents, be sure you can continue to save 10-20% of your income for retirement before adding the additional stress of paying back college loans into your household finances. Attending a dream school sounds glamorous, but being saddled with excessive debt for years if not decades to come is never a good choice. 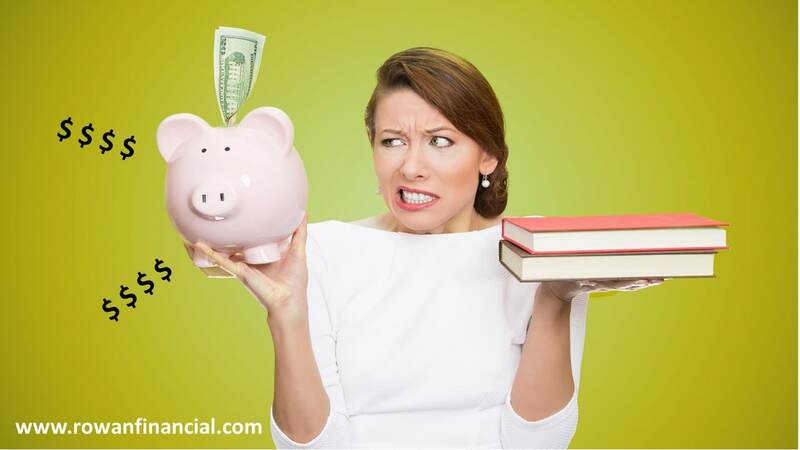 You’re better off selecting a more affordable institution and keeping the financial foundation of your family in tact whether that be continuing to save for retirement as parents or just starting to build your nest egg as a newly minted graduate.